One of the largest vintage aviation fly-ins and airshows in Europe, the Hahnweide Oldtimer-Fliegertreffen was held biennially from 1979 to 2013. The logistics of organising such a large-scale event placed a major strain on the local flying club, and the event took a hiatus from 2013 to 2016, returning in September ’16 with a new team at the helm. With a date now set for Hahnweide to grace the events calendar in 2019, we take a retrospective look at that last, glorious Oldtimer meeting. Many longstanding European aviation events are renowned the world over – Flying Legends, La Ferté-Alais and Old Warden amongst them – but ask many historic aviation aficionados if they’re aware of the Hahnweide Oldtimer-Fliegertreffen and you’ll likely find the answer is a resounding ‘no’. That Hahnweide isn’t better known comes as a surprise to those who have sampled its delights. 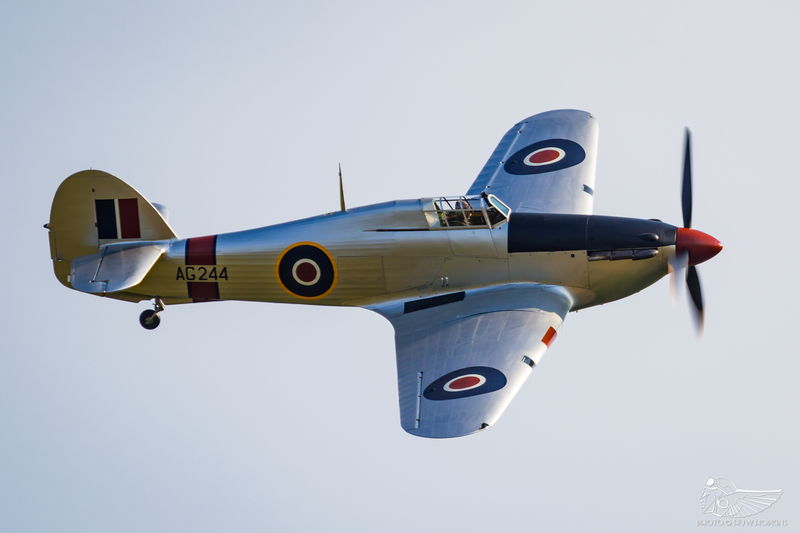 It offers a breadth and depth of vintage aeroplanes seldom found elsewhere over its three-day weekend, with typical crowd figures stretching well into the tens of thousands. 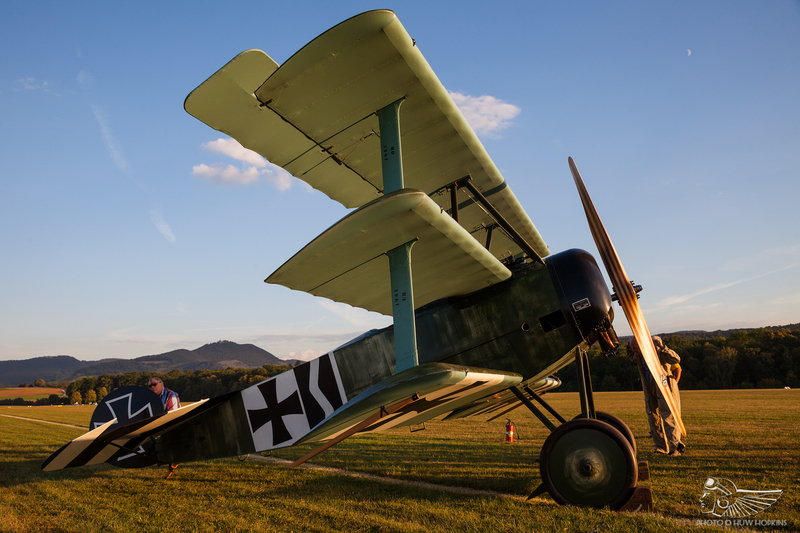 Despite its scale – upwards of 350 aeroplanes descend on the grass aerodrome for the weekend – Hahnweide somehow retains a uniquely intimate atmosphere. There are few venues quite so welcoming to the aviation enthusiast. 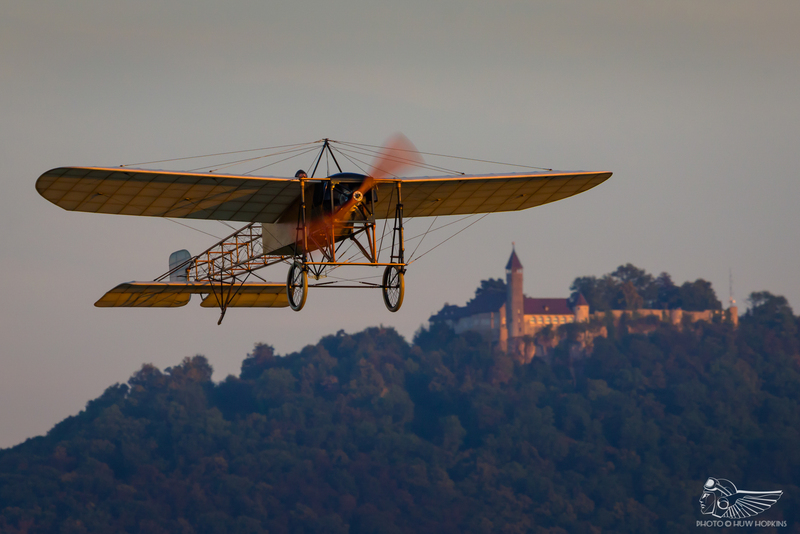 It’s a place where all aspects of historic aviation are celebrated; making the event entirely about the aeroplanes, forsaking any non-aviation sideshows on the ground, allows the Oldtimer meeting to thrive as one of the purest aviation events on the calendar. That all combines to make Hahnweide one of the very best vintage aeroplane fly-ins and air displays in Europe, quite possibly the world. Hahnweide had become a victim of its own success, however, and the logistical task tackled by the Fliegergruppe Wolf Hirth became unsustainable. The cancellation of the 2015 event followed, and Hahnweide was eventually postponed until 2016 to allow for a new organisational team to be assembled. Despite the extended break and new organisers, I was comforted by just how little had changed in 2016 – not just in the intervening three years since 2013, but since my first visit in 2011. Our group arrived at our accommodation in the little town of Kircheim-unter-Teck on Wednesday morning, greeted warmly by the hotel owner who we know from our previous stays. Taking a lovely Thursday morning stroll to the airfield under the rapidly warming sun gave a distinct sense of déjà vu – through an orchard where a rusty old tractor still sat, cresting a hill to see the end of Hahnweide’s large grass runway nestled among forests and woodland. At this point it is still just a sleepy German gliding airfield overlooked by a castle on a hill, with a flying club Cessna circuit training, as has always been the case upon arrival in previous years. 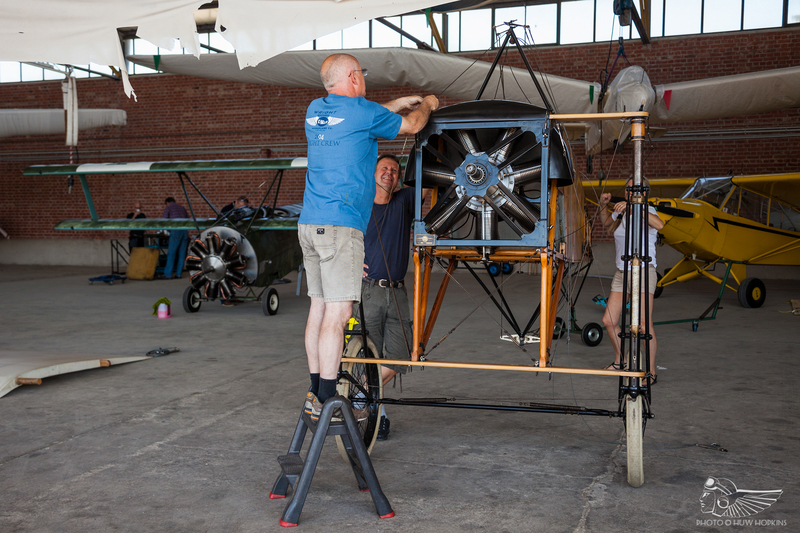 Some setting up was underway for the coming days, the building of marquees and the all important German beer bars being the most prominent, whilst Mikael Carlson could be found unloading and assembling his Blériot XI (Thulin A) and Fokker Dr.I in one of the hangars. At this point in the day the done thing is to take up residence on the veranda of the lovely on-site Italian restaurant, positioned within a few feet of the fence line, and typically the odd arrival buzzes into the overhead as the Weißbier flows and hearty plates of pasta and pizza are consumed. One of the defining moments of the trip to Hahnweide in 2013 came on the Thursday evening. 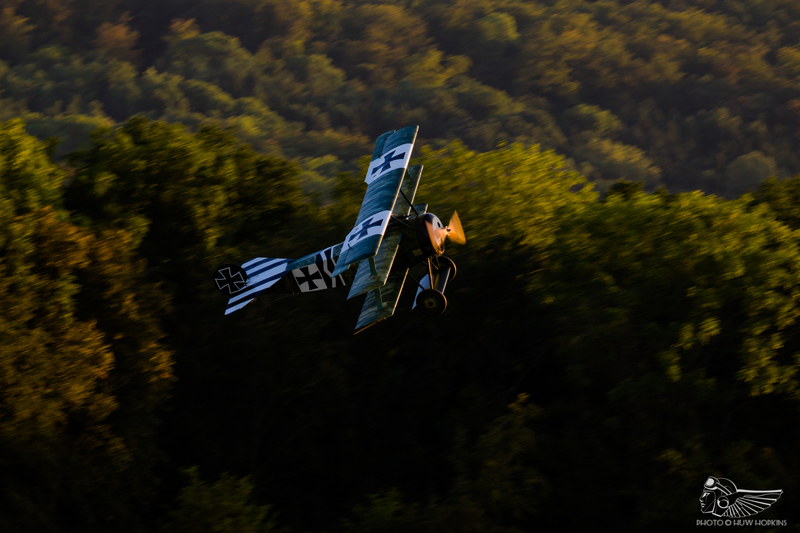 Having spent all day assembling his Fokker D.VII, Mikael Carlson took the First World War fighter aloft for an air test and practice display at sunset – an utterly perfect moment that was quintessentially Hahnweide. 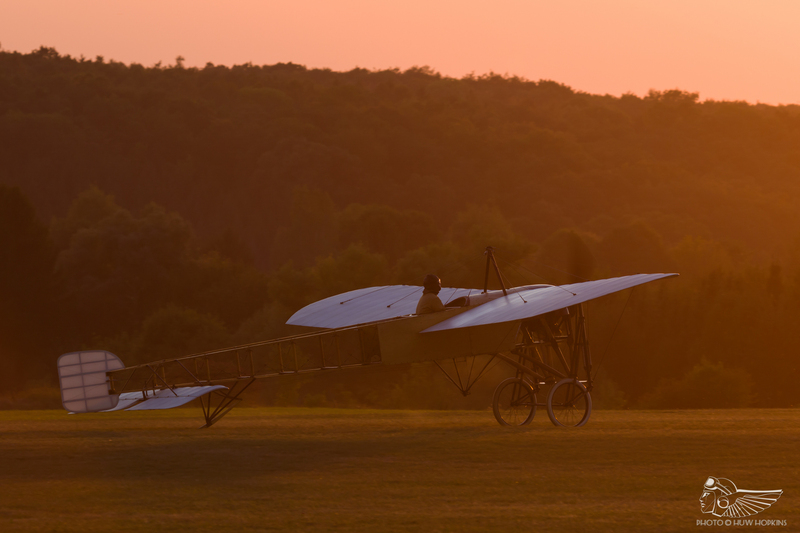 To the delight of those visiting the airfield on the pre-show Thursday in 2016, history repeated itself as Mikael prepared his Fokker Dr.I for a late evening flight.  With a small group of onlookers stood in a semi-circle around the Dr.1, Mikael went through pre-flight preparations and explained each step of the process to the gathered crowd as he went along. Soon enough he climbed up into the cockpit, the rotary engine was hand swung into life, and to avoid overheating the Dr.1 was quickly airborne, climbing at an astonishing rate for a First World War aeroplane. Mikael’s displays are stunning no matter which of his beautiful aeroplanes he is flying, but particularly so his fighters. 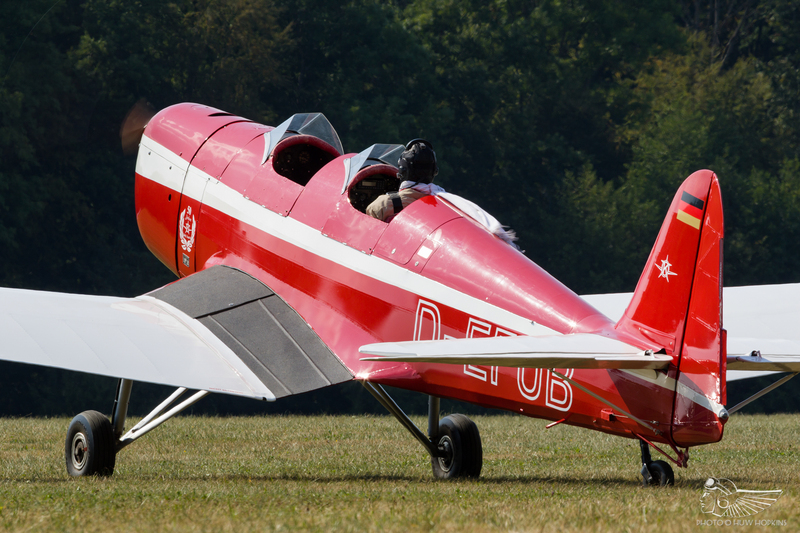 Routines typically include sequential aerobatic figures including loops, half-Cubans, split-S reversals and rolls. These punchy displays offer a striking, unique insight into the manoeuvrability of First World War fighters. After some aerobatics Mikael brought the Dr.1 down to lower level. The Dr.1 has an all flying tail, making it very difficult to fly well, but Mikael does so expertly with some amazingly tight flat turns using the large rudder. Between Hahnweide’s main runway and the adjacent forest there is a large dip in the ground and Mikael dived into this, disappearing from sight to gasps from the crowd, before popping up at the other end! Needless to say, after he blipped the little Fokker in to land with puffs of castor oil, shut down and climbed out he was greeted with a huge round of applause. The event proper runs from Friday, when most arrivals occur along with a smaller flying display, through Saturday and Sunday when the main airshow takes place. Hahnweide is the epitome of southern German hospitality, the event running quite literally from dawn until well into the night, with the airfield never truly closing on the show weekend – indeed, many take the opportunity to camp on-site, either in the grassy openings adjacent to the hangars and restaurant or, for those who have flown in, underneath the wings of their aeroplanes. There’s a loose formula to Hahnweide fly-ins. At sunrise the entire airfield live side, including the runway, is opened to the public for several hours, offering unhindered access to the entirety of the visiting aircraft (pushing 400 if the weather is good) sans barriers in a unique flightline walk. Of course, marshals are present along the line to keep everyone in check, but the lack of barriers shows of an inherent trust in the visitors not to touch the aircraft, not to overstep the mark, and it works. 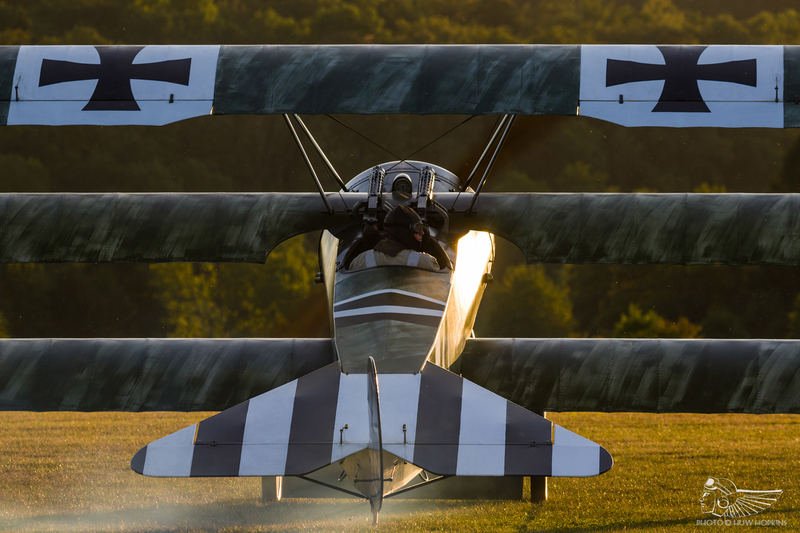 This is a dream for photographers, and although in places the aeroplanes can be tightly packed in, the dawn dew on the aircraft can create some wonderful images, backed with the sunrise over the rolling German hills. As the steadily climbing sun warms the chilly air the airfield slowly begins to fill with spectators – as many as 40,000 at its peak. 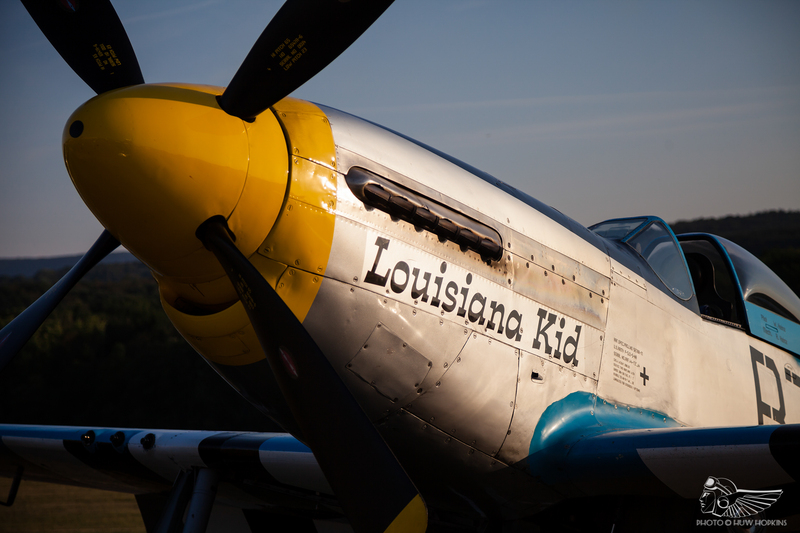 The vendors open for breakfast as the aircraft are readied for the flying display, which begins mid-morning and lasts until sundown. Coffee and apple strudel or Weißwurst with sweet mustard and a Pretzel are the order of the morning, washed down with a tankard of beer like the locals if you wish; all the while the airfield is abuzz with pleasure flights, arrivals and local sorties. Warbird numbers were still strong despite the aforementioned adjustments to the flying programme, with a mix of attendees from nearby in Germany and other European countries. Father and son Walter and Toni Eichorn, Hahnweide regulars, displayed a pair of North American radials in the form of T-6 Texan and T-28 Trojan respectively. A second T-28 was also in attendance from Belgium with a very nicely choreographed display, and from France the OV-10 Bronco, resplendent in desert camouflage, was a lively performer. 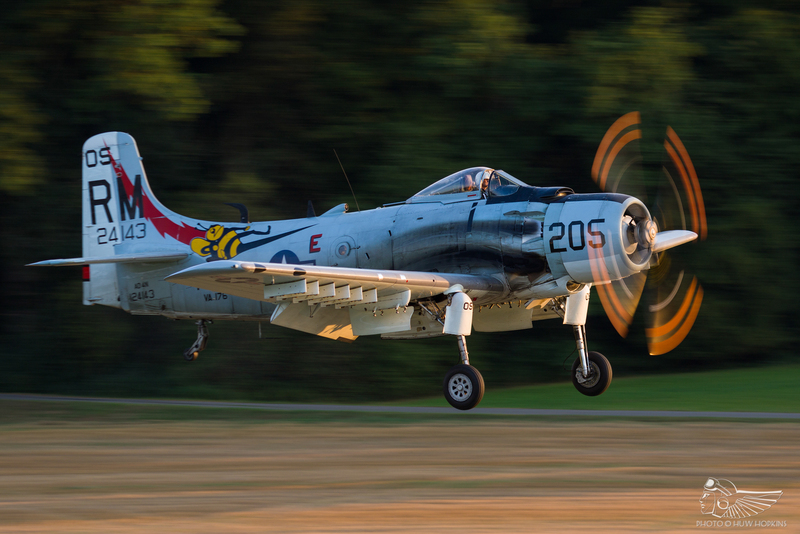 The Amicale Jean Bapsitse Salis Skyraider performed a lyrical aerobatic display in the early evenings of the show too, offering some heavier piston power. Stephen Stead brought two of his beautiful warbirds along with the Spitfire Mk.XVIe TE184 and Yak-3 joining the flying programme. 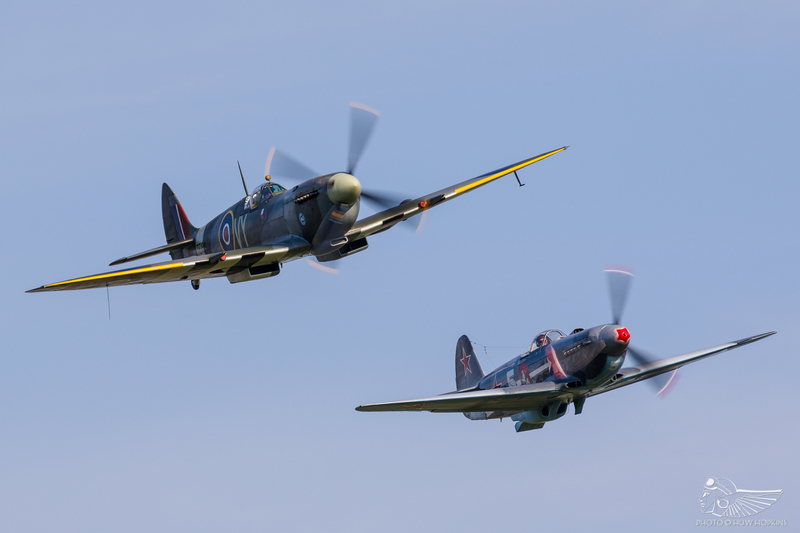 Dan Griffith flew his signature solo routine each morning in the Spitfire to a lively response from the crowd, before the pairs display later in the afternoon saw Stephen Stead leading in the Spitfire with the Yak-3 on his wing. New vintage aircraft collector Karl Grimminger was in attendance at the show with his DH.83 Fox Moth, T-6 Texan and beautiful silver Hurricane AG244. The Hurricane drew much attention in the flying display and was flown on one of the days by Klaus Plaza. Normally found at the helm of EADS Bf 109G-6 Red 7 – a landing accident the aircraft suffered prior to the show meant the 109 could not attend – Klaus’ energetic display in the Hurricane more than made up for the Messerschmitt’s absence. EADS did provide one of the star items, however, and the Messerschmitt Me 262 was one of the aircraft everyone wanted to see. Whilst not the most dynamic of displays, the sight of an Me-262 above southern Germany really is something to savour. 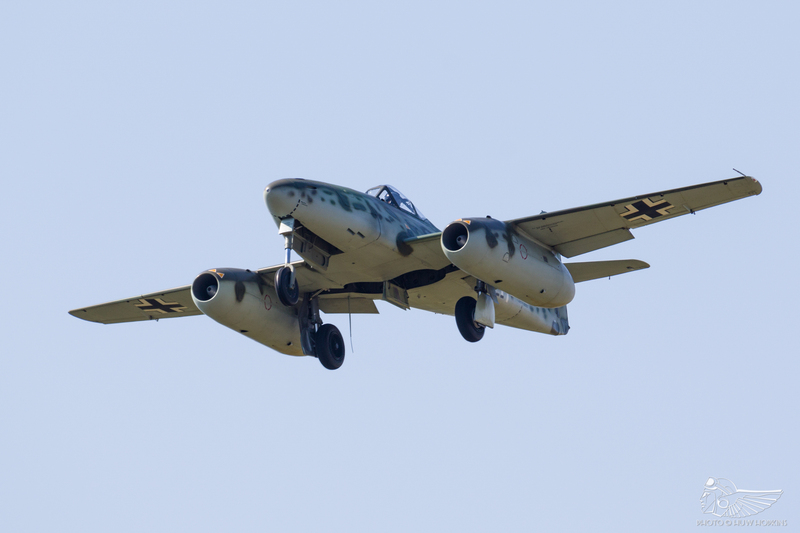 The Me 262’s low and close missed approach on Sunday put an exclamation mark on a memorable series of displays. Unsung gems of the European airshow scene are the Dassault Flamants based in Albert in France. The pair made the journey to Hahnweide wearing temporary olive drab schemes, masquerading as French Potez bombers for filming, and very good they looked too. A regular attendee at Hahnweide and popular amongst crowds and pilots alike was the inimitable Marc ‘Leon’ Mathis, who was tragically killed testing an experimental microlight in France in 2015. 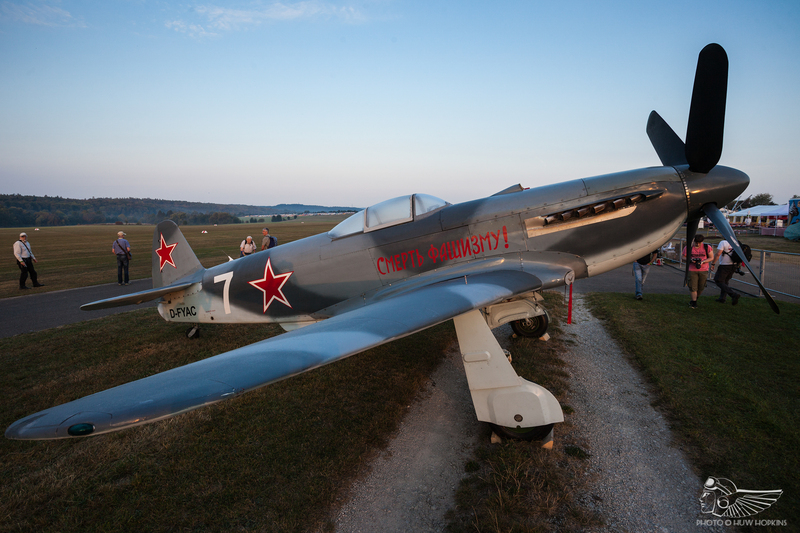 In previous years Marc had displayed at Hahnweide in Zlins, Mustangs, P-40s, Yaks and the FW 190. 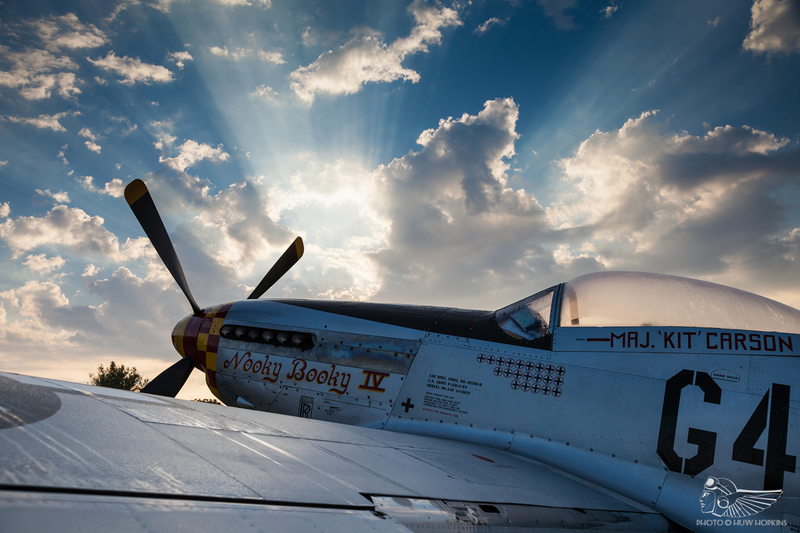 A tribute display was flown for Marc, including the France’s Flying Warbirds’ P-51D Mustang Nooky Booky IV and P-40N Little Jeannie, Yakovlev Yak-11 White 14 and a Zlin, the former three airframes ones which Marc had displayed at Hahnweide. 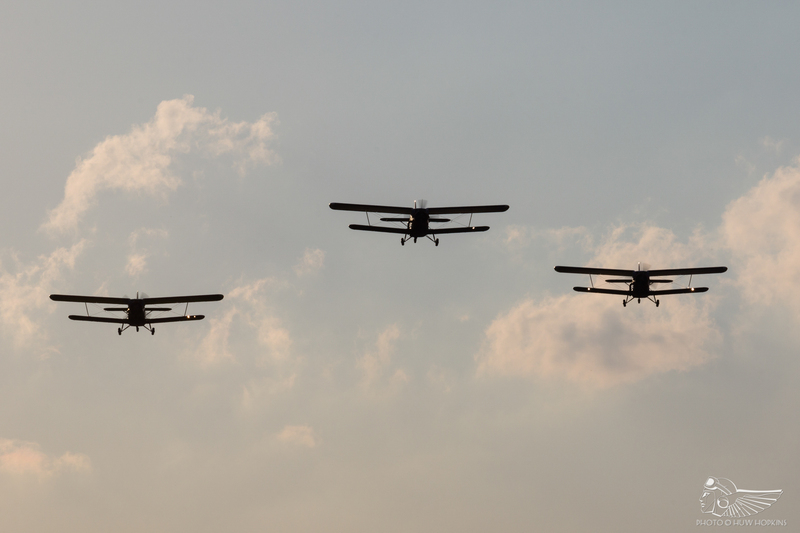 This quartet flew a missing man formation with the Zlin, one of Marc’s favourite aircraft, pulling up and out of formation and then circling high above the airfield as the warbirds displayed, as if Marc was watching from a lofty perch. That was a lovely touch. Hauling rides throughout the weekend were a gaggle of Ju 52s and An-2s, which are impressive to see thundering out of such a compact grass airfield. A trio of both types also performed during the airshow. The Czech An-2 team flew various formation flypasts, whilst the Ju 52s joined up for a brief formation pass which looked particularly fitting above Castle Teck – shades of Where Eagles Dare. One thing Hahnweide does well is to put several vintage types up together in what they call ‘corsos’. Several Klemms went aloft, all in attractive red and white paint schemes, with another flying solo later on in the programme – this earlier Klemm 25 is mounted with a funky LED-covered propeller, an electronic chip lighting the LEDs in tune to the prop’s RPM to display a consistent image (in this instance, the BMW logo was created by the LEDs) at any RPM. A Storch trio also displayed, including a very attractive white Swiss marked example. Although it did not fly during the weekend, one of the stars of the fly-in was a gorgeous Hatz CB1 biplane, something I had not seen before. Being a gliding airfield first and foremost it is no surprise that gliders play a prominent role in the airshow. 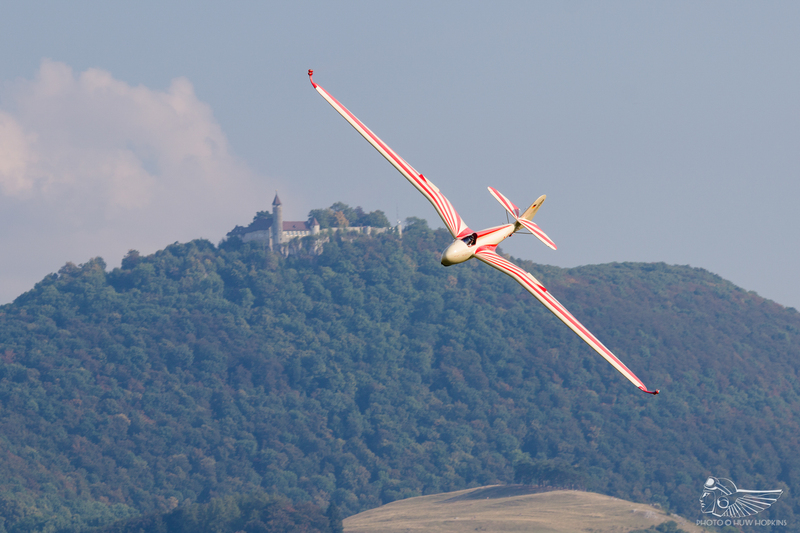 Along with a massed vintage glider launch, Hahnweide favourite Christophe Zahn returned in his Lo 100. One quirky act is a vintage glider pilot playing the bugle as he passes the crowd, a sight very much in keeping with Hahnweide’s European flair. During late summer in southern Germany the temperatures can soar. Along with increased humidity, which can be sweltering when outdoors all day, conditions can often lead to huge convective masses of cumulonimbus clouds and thunderstorms. No such reprieve was granted during the 2016 show, the air temperature only tapering off at dusk – it is at that time of night that some of Hahnweide’s most memorable moments occur. The calmer evening air is better suited to lighter, earlier types and on both Friday and Saturday evenings Mikael Carlson displayed one of his machines. On the Friday he went aloft in his Blériot for a beautifully flown sequence of low passes and tight turns, whilst Saturday saw a second, even more energetic Dr.1 display. After Mikael landed to rapturous applause, the crowd headed to the main hangar area for the evening’s festivities – there was no intention of going home any time soon, and good job too as the flying display stretched into twilight. On Friday and Saturday evenings, Team Blanix performed their sublime pyro display after sunset. 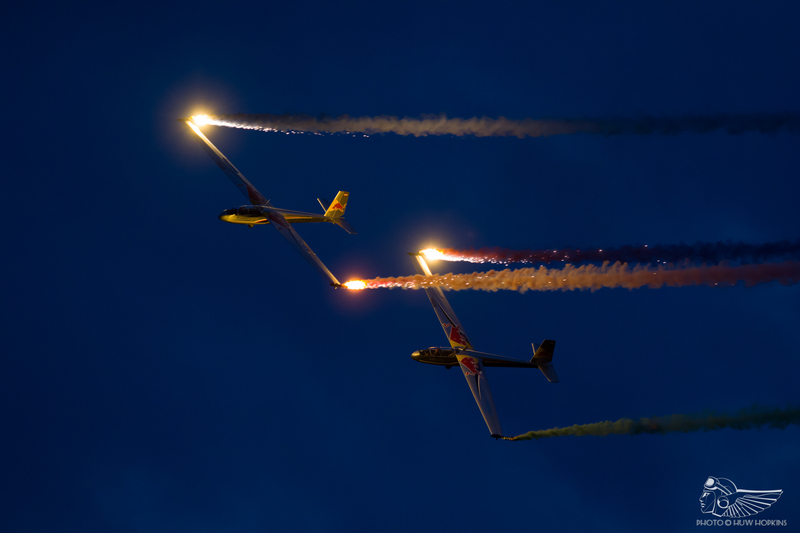 Flying a pair of LET Blanick L-13 gliders, they fly a wonderfully choreographed display punctuated by aerobatics with fireworks streaming from their wingtips. This serene spectacle is accompanied by some wonderful pieces of music well suiting of the routine’s tempo, such as Ennio Morricone’s Gabriel’s Oboe. Looking around,,everyone had stopped in their tracks to gaze at the spectacle, a crowd simply captivated by the majesty of flight even after a long day of air displays. It was really quite beautiful. As mentioned, the flying display itself is just a part of the overall Hahnweide experience and after this concludes people turn towards the vendors once again for some Bratwurst or Currywurst – and of course, the beer flows freely. 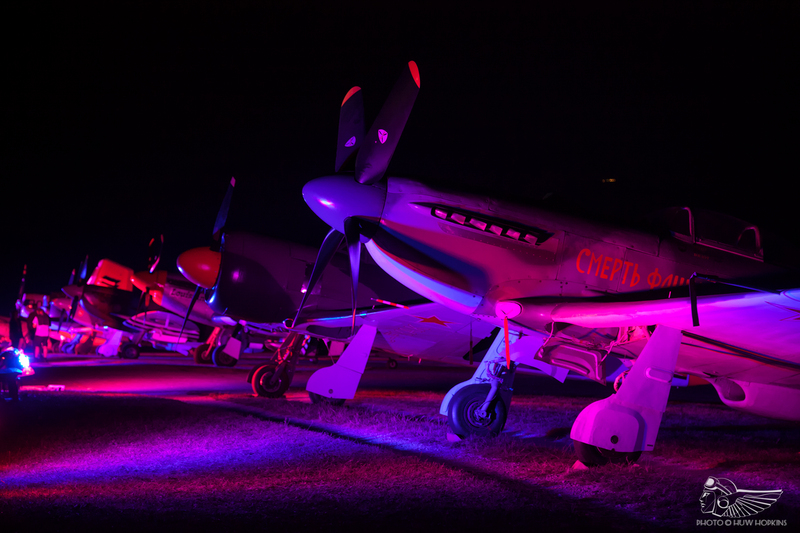 As night falls a multicoloured array of lights illuminates the aircraft parked along the flightline, providing the perfect backdrop to fun evenings. One of the hangars is converted into a makeshift Hoffbrauhaus for the weekend and a band at one end rattle through a really rather good blues set. As this is happening some remote control aeroplanes (and other contraptions, such as the USS Enterprise from Star Trek and, bizarrely, some remote control flying dolphins) are flown around indoors and out; a mechanical bird, an airship and a spaceship – everyone is having a wonderful time. 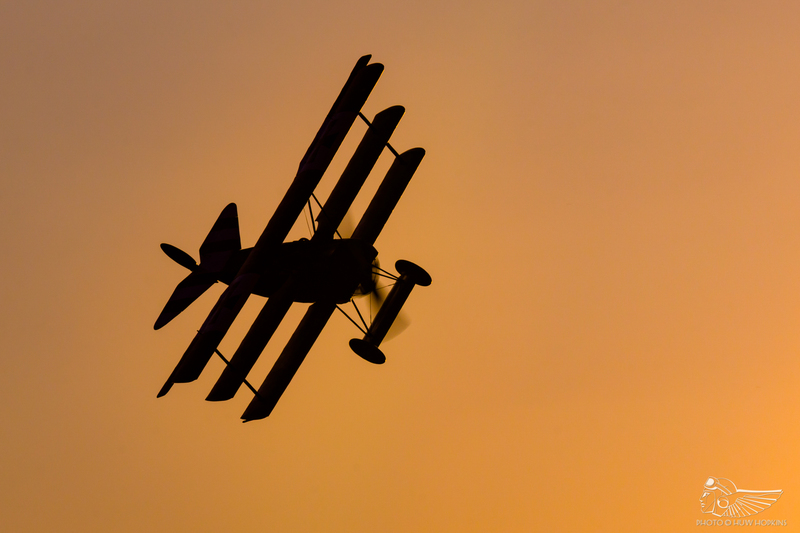 This all carries on until the early hours – there are very few, if any, aviation events that quite literally offer entertainment all day long, from dawn to dawn! 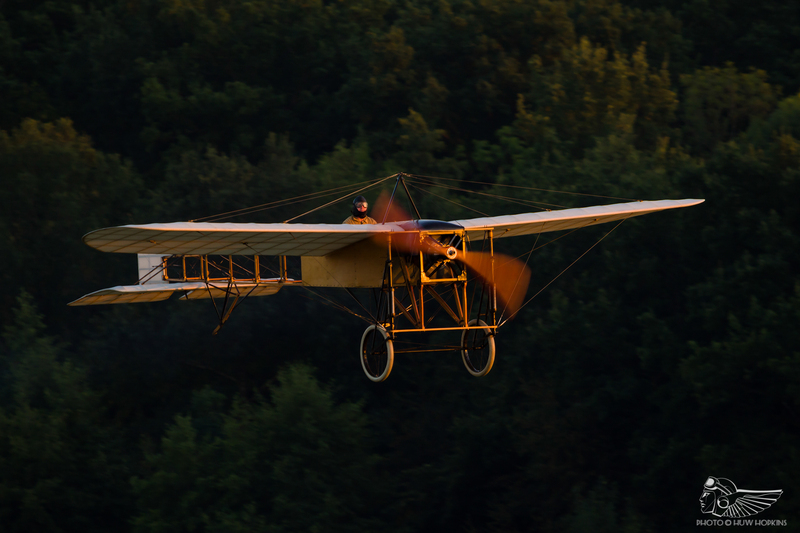 The spirit of aviation can truly be found at Hahnweide, with pilots, enthusiasts and the general public alike sharing in the wonder of flight and in each other’s company. The organisers say that everyone at Hahnweide is a VIP, and that is abundantly clear – there are no premium chalets or corporate enclosures and everyone, be they staff, pilots or public, receives the same treatment. 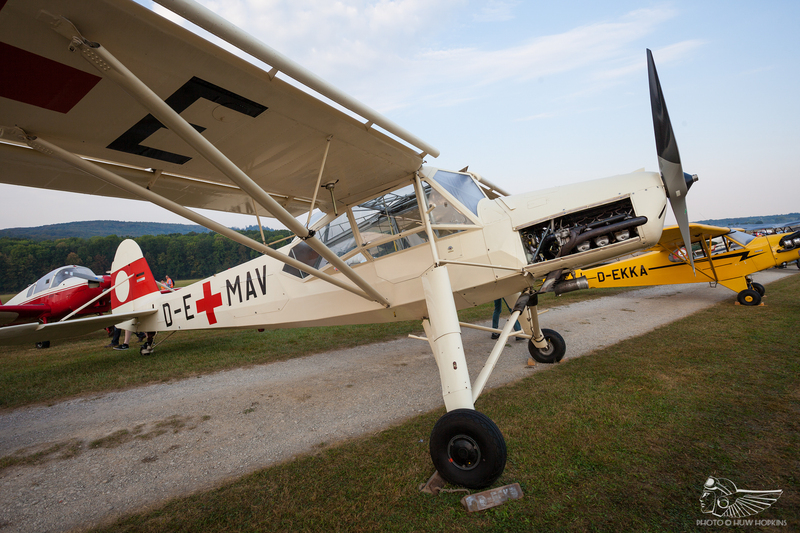 The Hahnweide Oldtimer-Fliegertreffen really is an idyll of vintage aviation. The 21 month wait for an announcement on Hahnweide’s future left many doubting whether it would return. 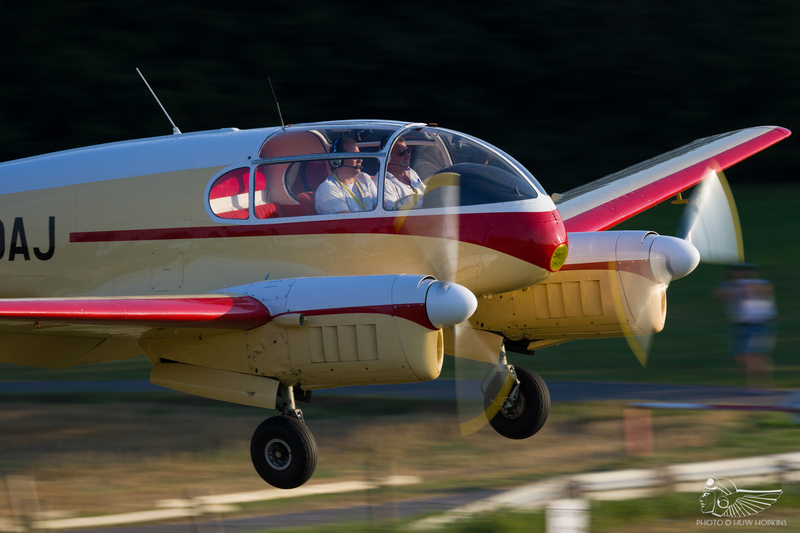 In recent years southern Germany has lost another longstanding aviation event, the Tannkosh fly-in. It would have been a dreadful shame to see Hahnweide suffer the same fate. In July 2018, however, an announcement was made detailing the return of the event on 13-15 September 2019; one can deduce that it has, for the time being at least, moved to being held once every three years. The wait between the biennial events was long enough – the protracted wait will now seem excruciating, but at least it is returning. 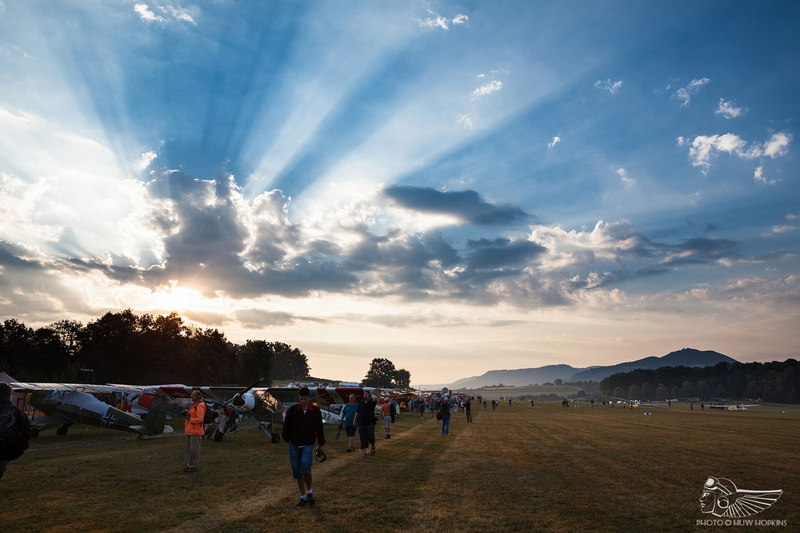 And so, to the dying embers of the last fly-in in 2016, and a moment that captured the joyous spirit of Hahnweide. After the flying display had ended on the Sunday evening we decided to meander back to the restaurant veranda for a drink before heading off for dinner. Whilst debriefing over a beer a sudden cacophony of engine noise and a flash of silver between the parasols sent several men rushing across the grass to the crowd line – the purr of Allisons and the flash of silver gave away a surprise appearance by the Flying Bulls’ P-38 Lightning and Corsair, en route to Austria from Sanicole, Belgium. Regulars in recent years at the Hahnweide Oldtimer-Fliegertreffen, their booking at Sanicole meant they were not in attendance at the 2016 show. Hahnweide lies directly between Sanicole and their base at Salzburg, Austria and pilots Raimund Reidmann and Eric Goujon decided to say a brief hello as they passed by on the final leg of their transit. We had joked earlier in the weekend that they could pay a visit on their way home, but hadn’t envisaged anything quite like the beat-up they gave! 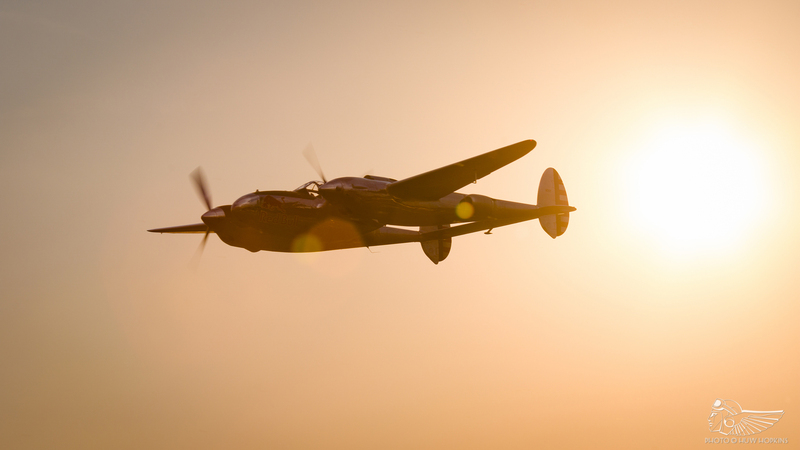 Raimund Reidmann performed some sweeping aerobatics in the P-38 in the evening sun before Eric Goujon brought the Corsair through at low level for a couple of passes. What great chaps, and what a great end to the 2016 event! We had wondered if that moment, and moreover the 2016 edition of the Oldtimer-Fliegertreffen, was to be Hahnweide’s swansong – and quite an ending it would have made. Thankfully Hahnweide will return, and eyes are now on the 2019 event to see how the next edition of the Oldtimer fly-in shapes up. The Hahnweide Oldtimer-Fleigertreffen will next be held from 13-15 September 2019.